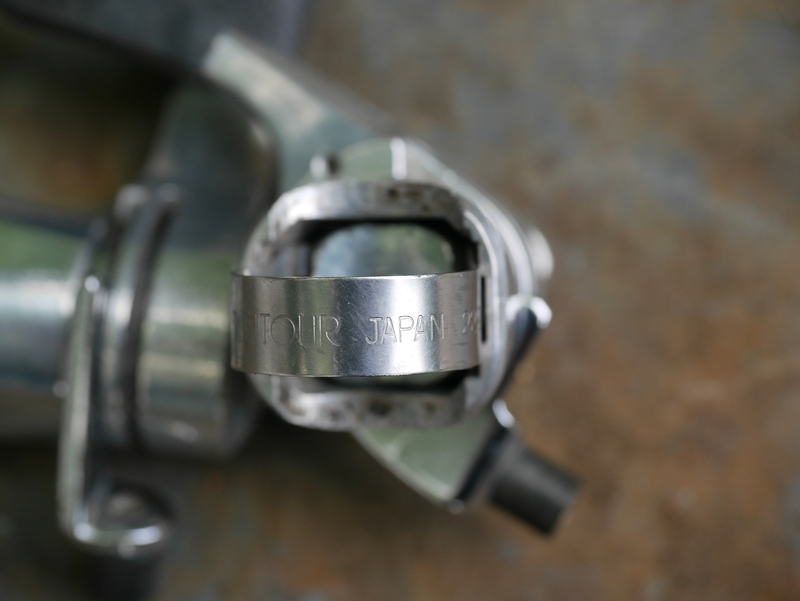 SunTour, (which began as Maeda Iron Works in 1912) was considered the most important Japanese manufacturer of cycling components up until 1988. At that time, the company was bought out by SR (Sakae Ringyo, which itself was bought out by Mori Industries around the same time), and from that point forward SunTour lost its dominance in the marketplace to Shimano. The forces which brought about these changes involved too-low pricing, less than insightful management decisions, R & D missteps, and just plain bad luck. 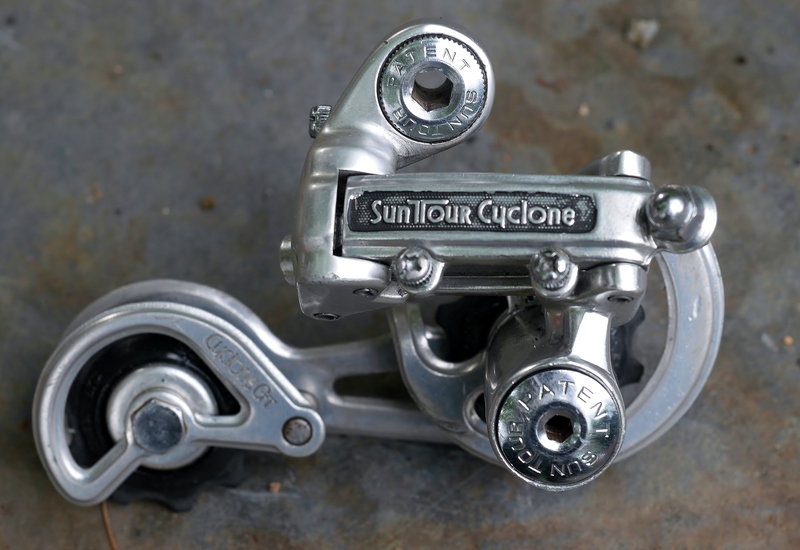 The lovely Cyclone rear derailleur pictured above is an example of SunTour’s prowess in its heyday. 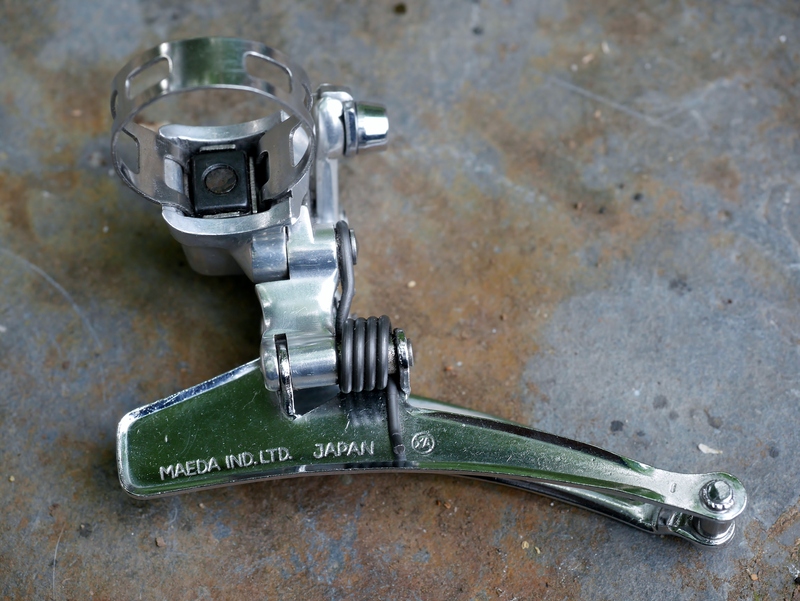 This mid-70’s derailleur weighs 175 grams, and features SunTour’s patented (in 1964!) slant parallelogram design with a spring on the upper pulley. The outer pulley cage is broken for easy chain replacement. SunTour’s patent expired in 1984, and the rest is history. Shimano copied SunTour’s slant parallelogram design, and became the dominant supplier of derailleurs for many decades since. The quality of SunTour components has always impressed me. I have used SunTour components in many vintage rebuilds. So, I decided to equip my new Rivendell Appaloosa frame with a full SunTour gruppo. 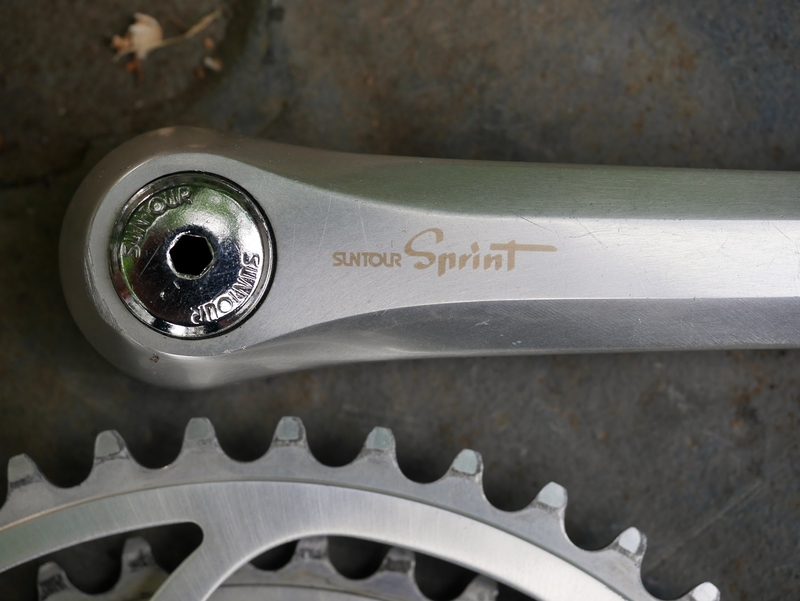 First up was the crankset and bottom bracket, for which I decided upon the Sprint lineup, which was competitive with Shimano 600 at the time of its introduction in the mid-80’s. 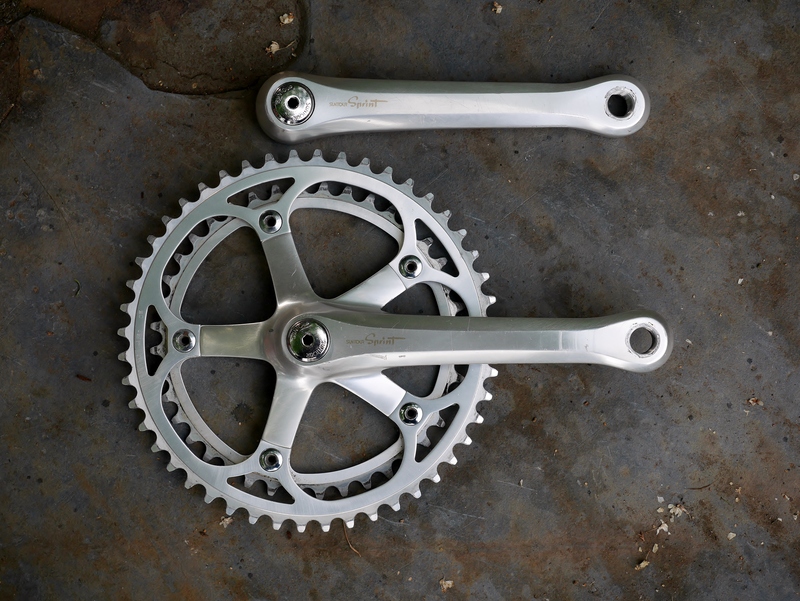 I was fortunate to source a NOS bottom bracket, plus a gently used crankset with useful 48/40 rings. The gold /bronze lettering will pick up nicely on the Rivendell’s frame colors. For the front derailleur, I selected a Superbe model from 1981, according to the date code on the back of the cage. This derailleur is so light weight that it doesn’t even register on my weight scale, which is calibrated in pounds and ounces. SunTour’s catalog lists its weight at 90 grams. One of the goals in building up my Appaloosa is to save weight where possible, and this derailleur is part of that plan, not to mention its purported excellent performance. 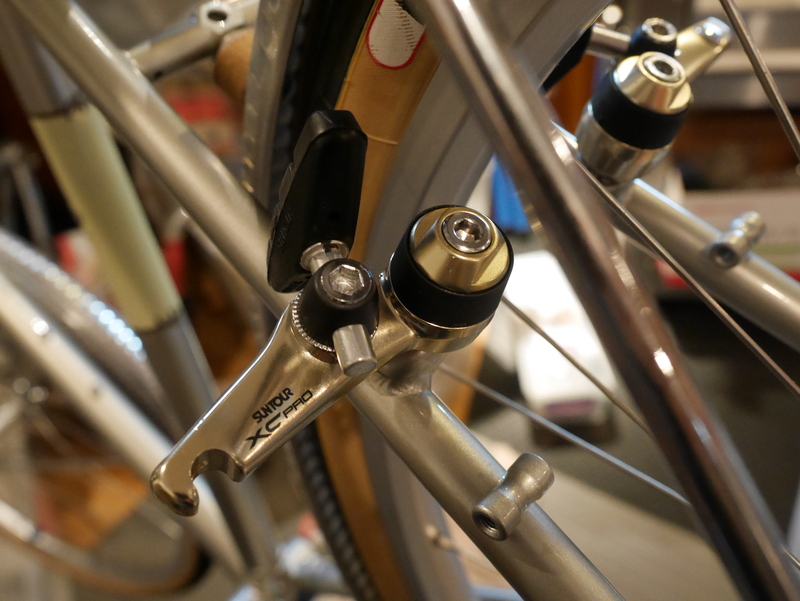 The Appy is equipped with canti bosses, and I really puzzled over the right cantilever brake set for this bicycle. 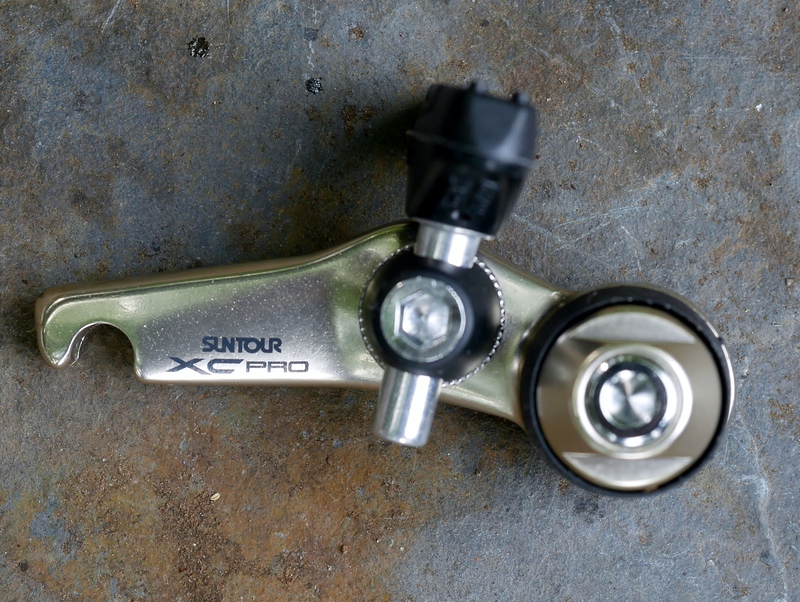 Once I narrowed in on SunTour, it was a no brainer to look for the best SunTour cantilever brakes, all the while knowing that these brakes were manufactured after SunTour was taken over by SR. These are the “champagne color” brake arms, and I was looking forward to seeing how they would look on the Appaloosa frame. I was not disappointed. While these brakes, with their internal springs, can be a little challenging to set up, I’ve used them a few other times and have gotten the hang of it (Paul’s cantis are similar in design). These brakes have a useful toe in washer, shown above, plus a ratcheting mechanism on the brake shoe shaft which makes fine tuning easier than other cantilever options. 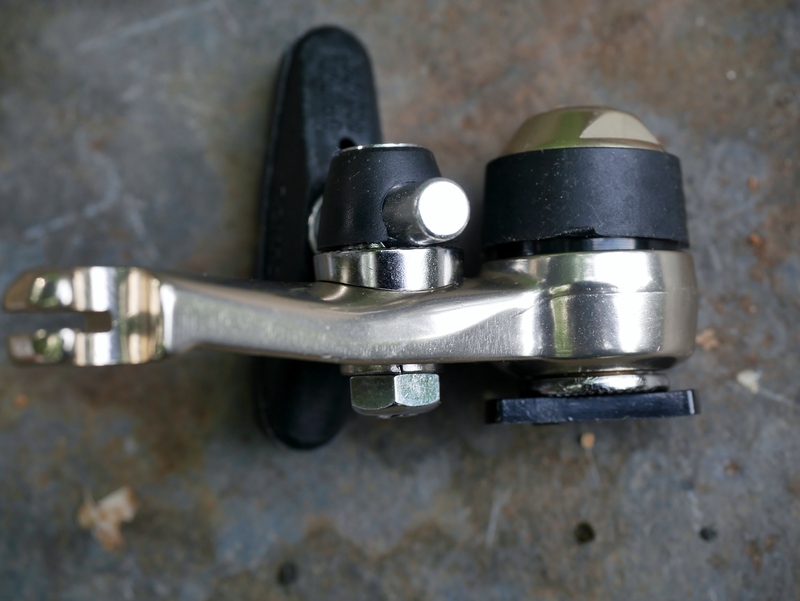 I had already planned on using SunTour’s bar end shifters (aka “Barcons”) for this project, but just in case, I also sourced some ratcheting 22.2 bar mount thumb shifters, shown above. 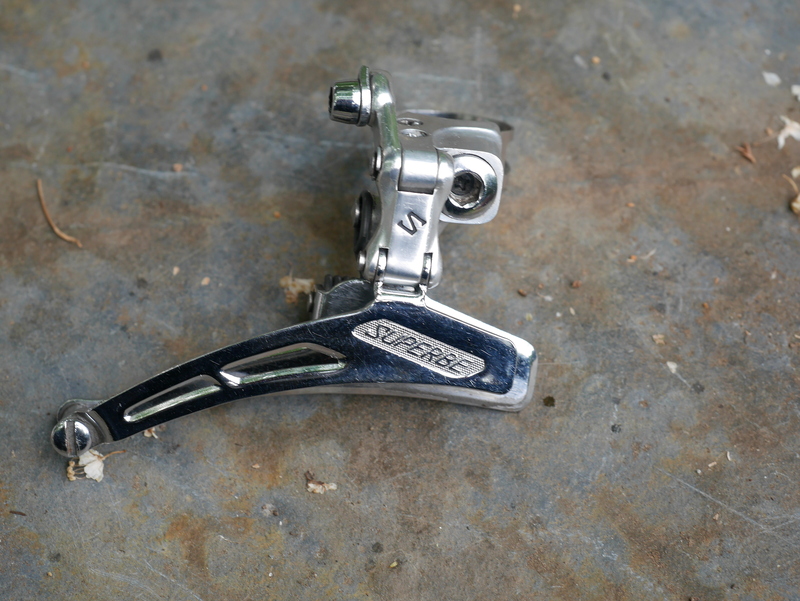 SunTour’s friction shifters are some of my favorites from this era. 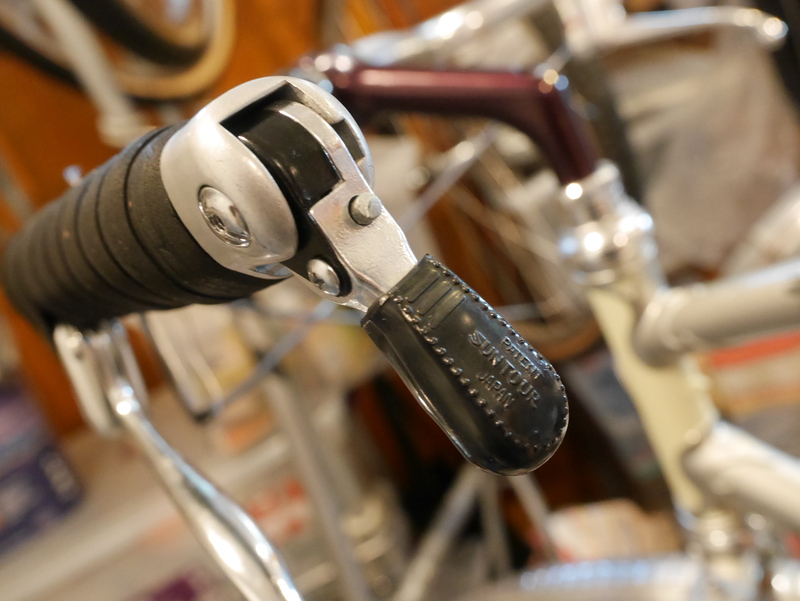 But, I fully expect to use these SunTour Barcon’s, shown above mounted to a porteur style handlebar. 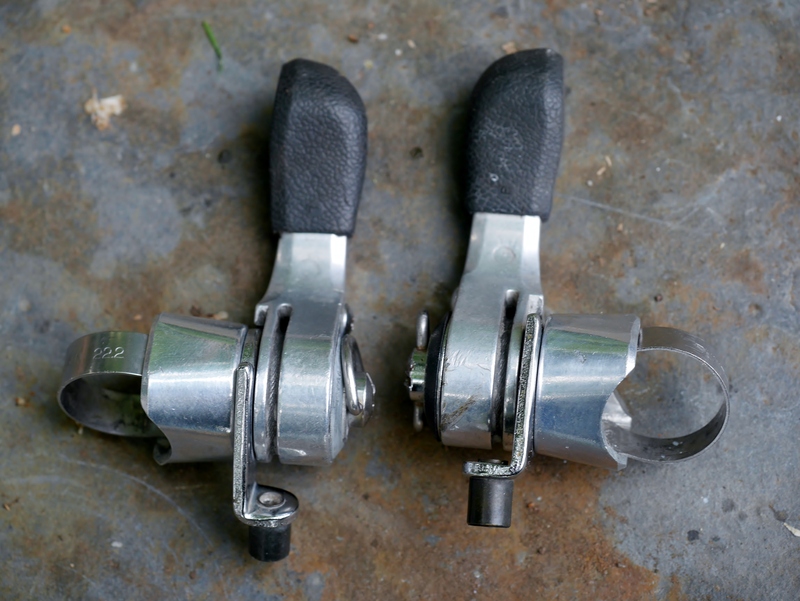 While I have used Shimano’s bar end shifters on many of my bikes, I really do like the feel and subtlety offered by these amazing pre-indexing ratcheting shifters. They are another example of the quality and reliability of SunTour components. 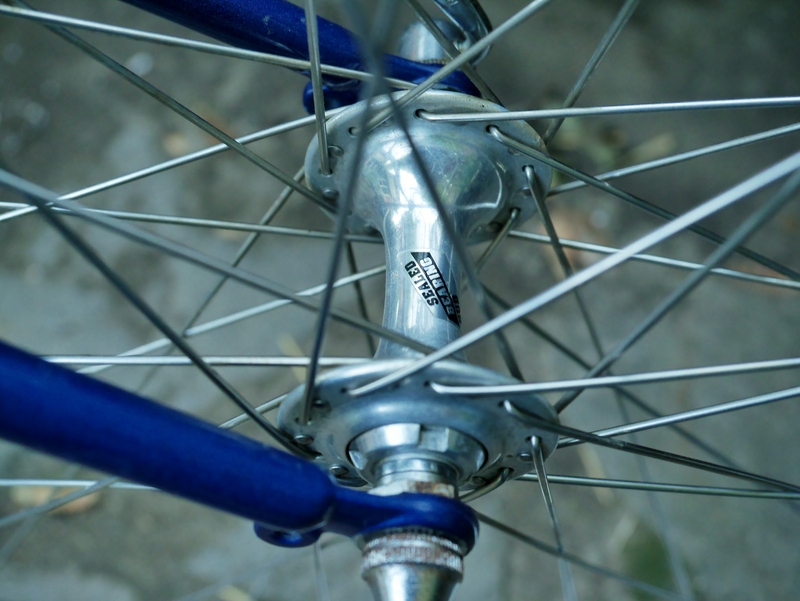 This entry was posted in Bicycle restoration by Nola Wilken. Bookmark the permalink. You didn’t mention the Superbe Pro hubs, which were smoother than the much-more-expensive Campagnolo Record. I equipped a 1990 Koga Miyata competition frame with the complete gruppo, except for the Cyclone rear derailleur, which I consider superior in action. The complete bike, with tubular rims and tires, is my favourite ride, with a fit an responsiveness better than my 2009 Ridley Damocles, albeit, 5lb. heavier. Thanks for sharing that. I haven’t used the Cyclone derailleur before, and I’m looking forward to the experience. Hi Don, I will see how the derailleur performs, but I think I will not be disappointed. As to your comment on the Superbe hubs, other readers have given similar reviews as to their smoothness. 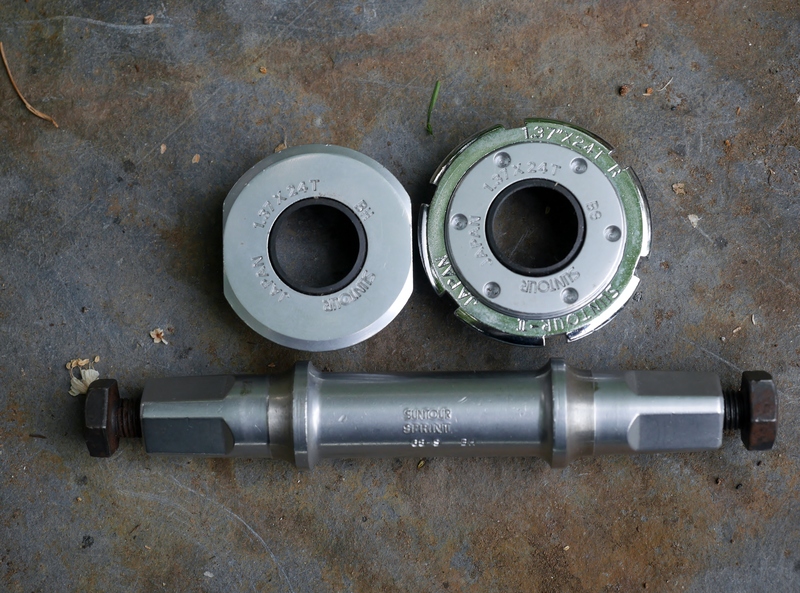 SunTour also made cartridge bearing hubs, which were equipped on this mid 80’s touring bike: https://vintagebicyclerestoration.files.wordpress.com/2016/09/2016-09-13-020.jpg Decades later, these hubs were friction free, spinning beautifully. you can tighten or loosen them by disassembling and re-clocking the spring. can be done in 180 degree increments. Thanks, Joe. I’ve used the VGX on several bikes, but not the Cyclone yet. Your comments make me look forward to the experience. I think it’s pronounced Superb, but what do I know? I’m looking forward to getting the components set up and will report back soon. The SunTour derailleurs are the best! I had a SunTour VX on my Fuji S12-S LTD road bike, it broke sadly but now I’m happy because I have a replacement. I love the other SunTour derailleurs too, like the Cyclone. settled on a cyclone mark II with sprint (pivoting) cage. got rid of the mark II GT’s (swinging) cage and now have better shifting and can switch between touring and road freewheels quickly (same chain/derailleur).